Every Tuesday, Thursday and Saturday I teach yoga classes. I like to flow between moving with the class and walking through the practitioners to adjust and give notes. After class I often do a 45 minute flow just for myself. Or I'll fit in a workout on the elliptical plus some core strengthening and lifting. That usually results in over two hours of movement, sometimes three and a half. I don't really think about that very much. Three of my classes are focused on slow-movement and therapeutic stretching. So anything that get's my heart-rate up on top of that is energizing rather than tiring. That being said, I usually can't eat much before I teach. All of the movement and talking isn't conducive to a full-stomach. So before I teach and practice I only ever eat something light: half of an avocado (plus gf toast if I'm hungry). Or a smoothie bowl. In fact, I'll eat a smoothie bowl after class as well most of those days. It's the fastest and most satisfying way to get good food and healthy fats into my body post-movement. I've been putting avocado in my smoothies for years. Eating plant-based fats calms my nerves and settles my stomach. I've only recently started adding banana back into my smoothie bowl routine. I'm not a huge banana fan. But undoubtedly frozen banana combined with other fruits and flavors makes for a thick, creamy, ice-cream-like concoction. And banana plus avocado makes for the sexiest, creamiest smoothie base possible. That's my kind of smoothie! I made this chocolate tahini avocado smoothie bowl post-yoga this past week on a whim. And, yeah, it's ridiculously good. Thick like soft-serve or pudding and best served very cold. I've been smothering it in red berries, adding hemp hearts, bee pollen and other goodies on top. Cacao nibs, soaked goji berries, the works. If you're a tahini fan, this one's for you! And here are some Friday links, just because! I spontaneously bought these rattan chairs (and these pillows) from Target this week and no regrets. I’ve been woefully lacking in seating for way too long. And damn if my space doesn’t look 5x more boho chic. This celebrity interview series is completely addictive. I’m particularly in love with the ones on couple Kristin Bell and Dax Shephard. Their personalities are strangely similar to Logan’s and my own. I can’t stop watching this vegan youtube food channel! The FDA is reconsidering it's definition of "healthy" thanks to Kind Bars. I've been following this guideline of "softening to harden" when it comes to my core workouts (and, em, all of my workouts). I've been seeing excellent results. It's all about taking it slow and resting / recovering in proportion to effort. How prioritizing spirituality can help you master your corporate job. I like to apply these principals to freelancing as well. It helps me deal with the constantly changing landscape of being an internet entrepreneur. Italian Cheesecake Jars! Berry Rhubarb Crumble! Coconut Twix Bars! Internet's vibey dessert game is strong rn. Also I just want to sink into a bath with this lavender oat milk powder from Kale and Caramel. EVENT ANNOUNCEMENT: If you're in the Charlottesville-area join me and my band for a May Moon Masquerade and potluck! There will be local cider on draft, high vibe herbal teas from Elderberry, mask making, ethereal tunes from my band, hypnotically rhythmic spiritual folk from Lobo Marino and plenty of mindfully-mad dancing through the evening. You best believe I'm making cookies to share! This bowl is best very cold! So if you’re planning this ahead of time chill your avocado before blending. If you’re putting this together on the fly, just stick the whole thing bowl in the freezer for 5 minutes or so before digging in! In the bowl of your high powered blender, combine the frozen banana, avocado, tahini, almond butter, dates, cocoa powder and salt. Add the coconut water and blend until smooth and creamy, scraping down the sides of the blender as you need to get everything incorporated. 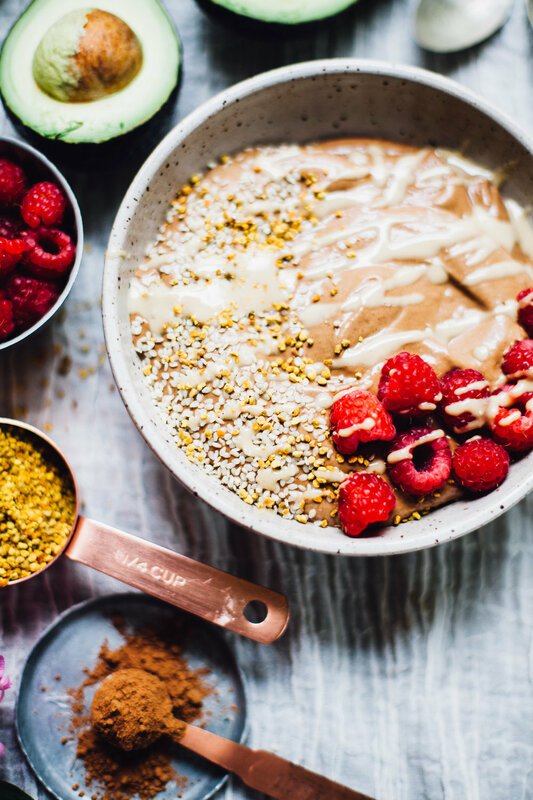 Pour your smoothie into your serving bowl and top with bee pollen, raspberries and sesame seeds (or any other toppings you desire!). Enjoy!